The list goes on, but those were the biggest ones. We're six weeks in and things are going really well. I feel like all of the areas I'm working on affect each other, so if I can keep all the balls in the air, all the balls actually stay in the air. We stayed within our means last month financially. Weight loss is happening slowly, steadily, and healthfully. We have eaten out less and cooked more. One change in our lives has helped me with all of those areas. It's helped me be more active, eat better, spend less money, keep my Levi more active. Seriously, it has been the BEST thing for me in the last two months. I made a commitment to Herb and my doctor about my fitness goals and how often I realistically would go to the gym. I have only missed one or two "appointments" in the last two months. Making working out such a priority caused me to want to eat better - why would I kill myself on the elliptical and then stuff my face with crap? We spend so much time working out (Levi goes to kid's club) and then swimming in the pool, that I really don't have time to go shopping. The rec center is 2 miles from Target, and I haven't stepped inside that wonderful establishment at all this year. If there's something I really need (wedding gifts, vitamins, etc), I buy it from Target.com and get free shipping with my red card. I still get my Target deals, I just don't have anything else sneaking in to my cart. And the swimming, oh the swimming. I'll admit, getting all ready for a morning at the pool is a lot of work, but sometimes the mommy guilt of dropping my kid off so I can go exercise really gets to me and knowing we are going to have 1:1 time in the pool helps me justify it. We try to get Levi in the water at least two times a week, and it has been INCREDIBLY fruitful. His preschool teachers have some concerns about his motor skills and muscle development, so all this extra activity has been really good for him. When we first started going to the pool, he wouldn't let go of me, even in the very shallow water. After weeks of consistency, he is now a goggle-wearing underwater-swimming fishy who also can float on his back. All on his own - no formal swim lessons (yet). He is still afraid of "deep water" but I put on goggles sometimes too and I can see that he's actually swimming underwater, not touching the bottom at all in the 3 foot deep pool. It's so freaking exciting to watch this new skill develop. 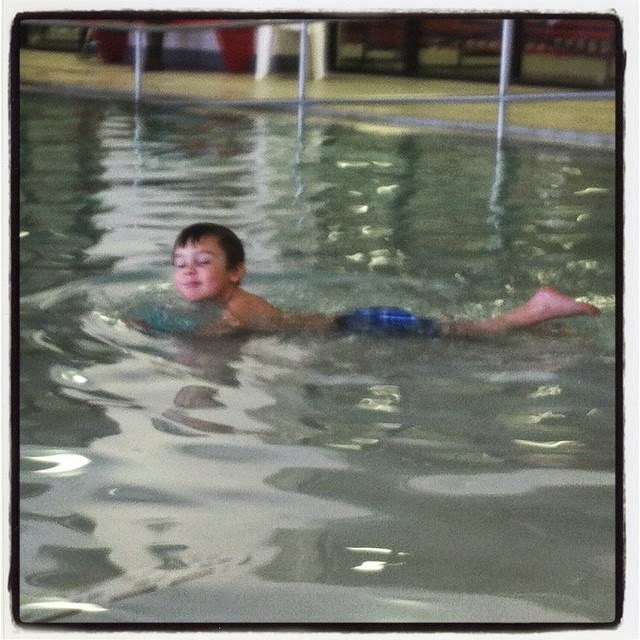 We're hoping to enroll him in swimming lessons this spring or summer. The gym is expensive, this I know. We were so blessed to be given a year membership, and I cannot take that for granted. I'm praying that we can continue to become a more healthy family!